Brownie with Ice cream is my all time favorite dessert recipe. This homemade fudge brownie is an awesome recipe to surprise your friends and family members. We can add more flour to make the same recipe and make it into cakey brownie, all we need is extra 1/2 cup flour and 1/2 tsp baking powder. 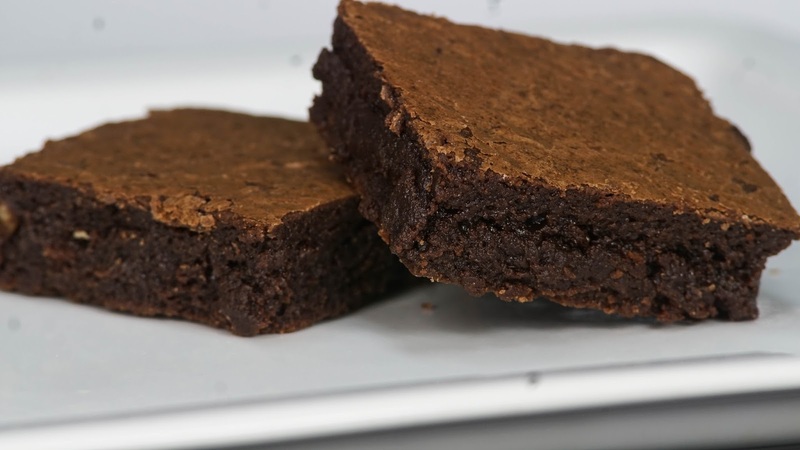 Lets see how to make this easy and simple Brownie recipe. Step 1) Sep up Double boiler:- heat water in a big pan, once water boils and starts to steam place a bowl on top and add the chocolate chips and butter. Melt until it is smooth and creamy. Step 2) Take if off from the double boiler and add sugar, Mix well . Once the mixture is slightly cooled add 3 eggs one at a time and mix well until well incorporated. Step 3) Add cocoa powder, salt and vanilla extract and mix well. Finally add flour in small batches and mix well without any lumps. Step 4) Adding nuts is optional, I have added walnuts today , we can also use cashews, chocolate chips instead of walnuts. Mix well. Step 5) Transfer the batter to a greased 9 inch pan lined with parchment paper and bake it for 20 minutes @ 350 F / 175 C.
If you are using 8 inch pan it takes approximately 25 minutes. Step 6) Once baked let it cool for sometime. Once cooled cut it into desired size. That's it our delicious brownie is ready to be served with ice cream . We can heat the brownie for few seconds and then serve with ice cream. Hai Steffi, I like all your recipes and tried so many items. It came out well. I tried ur brownie. I used heart shaped baking tin. In this I baked it for a total of 55 minutes. But also the bottom is little bit moist. Can you guide me some tips regarding this. Hi Steffi. Your recipe is super simple and is a must try. Can I use compounded chocolate in place of chocolate chip?